Large size White Shallow Folding Market Trays sold by the 6-Pack measure 11" x 7-1/2" at the top, 9-1/2" x 6-3/8" at the bottom, and are 2-1/8" deep. Trays are shipped flat. Use with our C18BC or GBB2B basket bags, but you'll need to tape down the bottom corners of the cello underneath the tray for a beautiful presentation. For shrink wrapping, use 1216SB for a flat presentation that's even with the tray. Tall presentations use shrink wrap 2030SB. 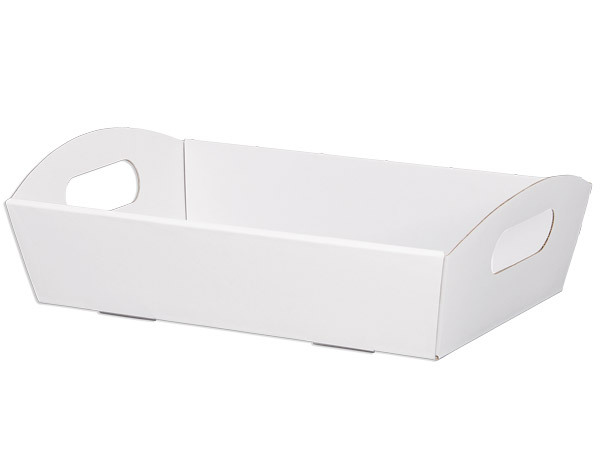 Shallow Folding Market Trays are versatile containers made from E-flute corrugated board. These tray are used for the bases of gourmet gift baskets, food baskets or even as a home decor decorative accessory. Open top beveled containers have cut-out handles.